Back in Oz to launch Here Their Dreams here and I'm very pleased to say it's in the shops as I write this. And the album launch shows are in Melbourne and Sydney this week. The band includes Danny Tulen and Daryl Bradie from Gersey/Tall Buildings, Miles Browne from Art of Fighting and actress/writer/musician extraordinaire Jayne Tuttle on Mellotrons, organs and percussion. Hope you can all make it! With special guest Mick Turner. 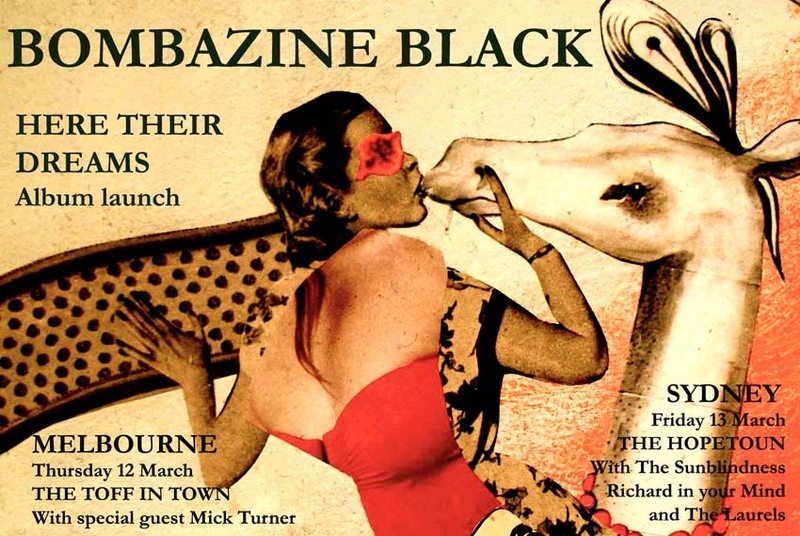 Mick on at 8.45pm, Bombazine Black on at 10pm. Tickets $12 pre-sale or $15 on the door. With The Sun Blindness, Richard In Your Mind and The Laurels. Doors open at 8pm, Bombazine Black on at 10:30pm. Tickets $12 on the door.